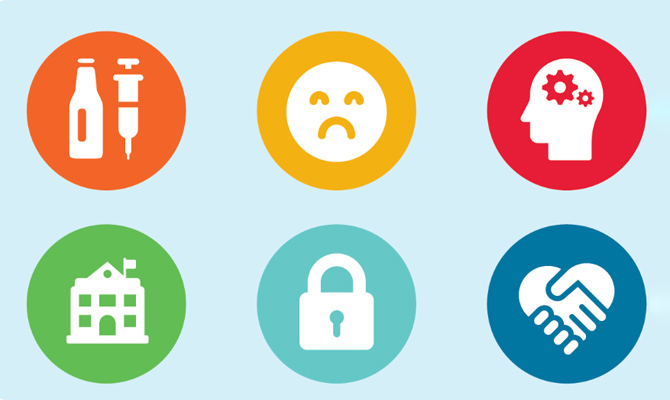 Kidsdata, in partnership with WestEd, recently released a comprehensive suite of data on youth in schools in more than a dozen topics, from bullying and cyberbullying to school climate, school safety and student support. 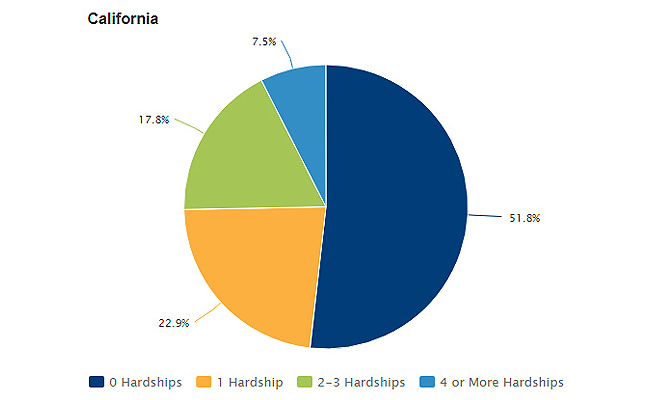 These data come from the 2013-2015 California Healthy Kids Survey (CHKS) and California School Staff Survey (CSSS). Learn about the largest statewide surveys of school climate, risk behaviors, and protective factors in the nation and how to access the data. Audience questions are highly encouraged. Speakers will be available for questions immediately after the 30-minute briefing. Lori Turk-Bicakci is a senior manager at the Lucile Packard Foundation for Children’s Health. She oversees kidsdata.org, a publicly-available data resource on children’s health in California. Dr. Turk-Bicakci ensures that the data and information are high-quality, relevant, and user-friendly, and she works with researchers and advocates across California to address key children’s health issues. Before becoming a researcher, Dr. Turk-Bicakci taught social studies in middle school. She holds a PhD in sociology from University of California, Riverside and a teaching credential from University of California, Davis. Thomas L. Hanson, PhD, serves as Director of WestEd’s Health and Justice Program, which works to strengthen the capacity of institutions throughout the community to provide the supports, knowledge, and skills all people need to succeed – especially those in the most challenging circumstances. He directs the California School Climate, Health, and Learning Survey System (CalSCHLS) project. CalSCHLS – which consists of a suite of psychometrically sound student, staff, and parent surveys – was developed by the California Department of Education to assess all major domains of school climate and safety; learning engagement; youth strengths and needs; and developmental risk and protective factors at the local level. Kidsdata.org, a program of the Lucile Packard Foundation for Children’s Health, is a public resource with wide-ranging data on children’s health in California. WestEd is a nonpartisan, nonprofit research, development, and service agency. WestEd aims to improve education and other important outcomes for children, youth and adults. 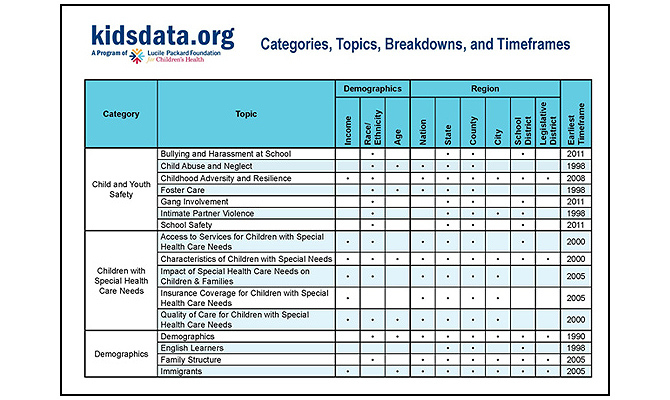 Our Data Overview Guide provides a complete list of all the topics available on kidsdata.org. You can quickly view popular data breakdowns for each topic from demographics like income, race/ethnicity and age to regions, including national, state, county, city, school district and legislative district. Also, see the earliest timeframe available for the topic to assess change over time. Get more information like this overview by visiting kidsdata.org/about. A comprehensive suite of data, Youth in Schools, includes new and updated indicators across more than a dozen topics from the viewpoint of California’s students and school staff. These data are available for state, county, and school district levels, and student-reported data are easily customizable by grade level, gender, race/ethnicity, sexual orientation, parent education level and level of school connectedness. 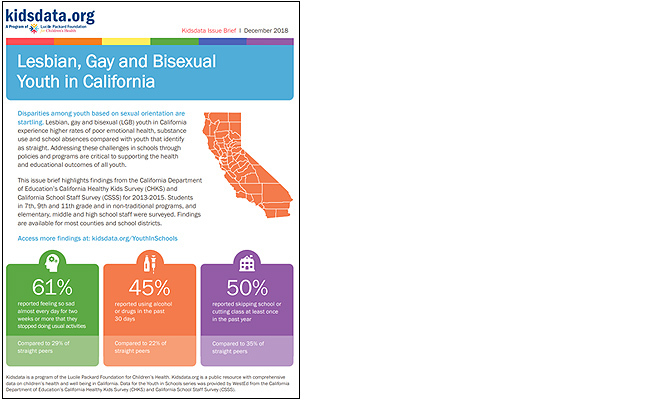 Youth in Schools data come from the 2013-2015 California Healthy Kids Survey (CHKS) and California School Staff Survey (CSSS), the largest statewide surveys of school climate, risk behaviors, and protective factors in the nation. 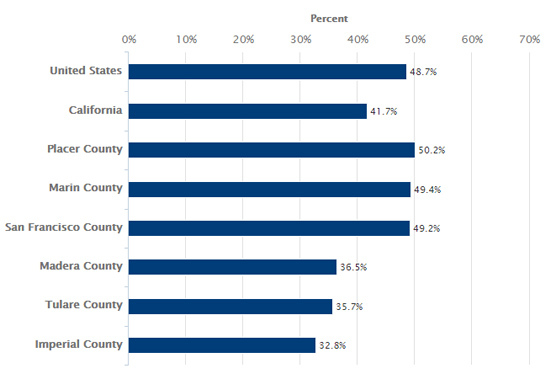 This data release is made possible by a partnership with WestEd who developed and administered these surveys for the California Department of Education. A complete list of Youth in Schools data is below. Learn more about the data, including helpful webinars, in our A Deeper Look section. For indicators that are new to Kidsdata – look for the [NEW] notation.